Ancient Rome was a society where a man’s role was far more important than that of a woman’s. They had absolute authority over the family and in certain instances could even sell their children into slavery. The public life of ancient Rome was also largely but not exclusively reserved for men. Like other conventional societies, men in ancient Rome enjoyed the status of power. It was also men who mainly worked in agriculture, trade, and other professions. In urban centres, there were various places for mingling and socialisation for men of ancient Rome. The history of the men of ancient Rome can be traced back to the earliest settlements in Italy. In fact, two men of ancient Rome have central importance in the founding myth of Rome. According to this account, Rome was founded in 753 BC by two brothers named Romulus and Remus who were raised by a she-wolf. Subsequently, Rome went on to become a society where a man’s role was always superior to that of a woman. The men in Rome played the central role in shaping the direction of Rome as a republic and then as an empire. 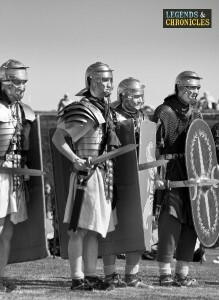 A group of Roman soldiers with shields and swords ready to attack. The role of Roman men in society was considerably higher than women and slaves. The society was composed of free men as well as slaves and there were thousands of slaves in the empire. These slaves were an important factor that sustained the economy of the empire. Free men married in their late teens and early twenties and choose their partners very carefully because divorce was rare in ancient Rome and was probably considered a taboo. Men of lower classes were usually farmers, shopkeepers, or craftsmen. In the afternoons, gatherings took place at public baths, theatres, and other places of socialisation. A Typical day varied in the lives of the ancient Roman man depending on their social standing. Men from the lower classes worked on their land or looked after a small business in the form of shops. The daily meal of these men consisted of wine, olives, cheese, and bread. Men of upper classes, on the other hand, had slaves to look after their business and therefore had more leisure time to indulge in more intellectual pursuits. Their daily meals had such ingredients as meat, fish, fruits, bread and honey. In 1 AD, bread began to be distributed among the unemployed on daily basis. The family life of men of ancient Rome had well defined roles and responsibilities. Man enjoyed the role of authority in the family and acted as master over his wife and children. He also had authority not only over his children also the wives of his sons and his nephews. Thus the structure of the society was patriarchal where the eldest male member of the family was considered the authority. Men could claim the possessions of their children and could even sell them into slavery. Thus men had central importance in the family life of ancient Rome. 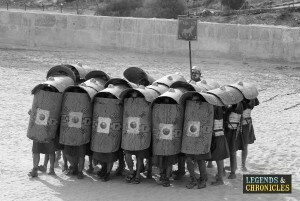 The tortoise formation in display from a legion of Roman soldiers, also know as the testudo. Dressing was a very important social factor in ancient Rome since it signified the social status of the person. Thus the clothes worn by men from the common people were made of coarse and dark materials. On the other hand, the men from ancient Rome who belonged to the upper classes used clothes made of fine material such as wool and linen. Senators wore tunics with purple stripes which signified their status too. Civilian men from ancient Rome wore longer tunics compared to the men of the military. The long tunics worn by most men Rome were called togas and there were different types of togas for young boys and men. A variety of jobs were available for any man from ancient Rome and some of the most common jobs included farming, trading, construction work, and military. Men of upper classes worked as politicians and in administration. Roman men in the urban centres were mostly involved in trading and merchandise while men in the countryside worked as farmers. A sizeable portion of the Roman men were composed of slaves who worked in almost every important field of life including art and entertainment, farming and teaching. There were many famous men during the times of ancient Rome, most of them were emperors, generals, politicians, and philosophers. One of the most infamous emperors of ancient Rome is Nero who is also called the madman of Rome. He came into power after his mother murdered his emperor step-father Claudius. Another famous man was Brutus who took part in the assassination of Julius Caesar. One of the most well known emperors was Constantine the Great who unified the fragmented Roman Empire and also became the first Christian emperor. It was after Constantine the Great that Christianity began to be accepted in the Roman Empire and started a new chapter in the history of Europe. A lot of famous Roman emperors, politicians, philosophers and other people have left their mark on history. Augustus Caesar can arguably be considered among the most famous men of ancient Rome. He was the general who laid the foundations of the Roman Empire in the first century BC and continued to rule until his death in 14 AD. Augustus was the adopted son of Julius Caesar who was assassinated by the Roman senators and was later immortalised in a play by William Shakespeare. Marcus Aurelius was famous for his dual role as a ruler and a philosopher. Among the famous Roman philosophers, we can include Lucretius, Cicero, and Seneca. Ancient Rome was a patriarchal society where men held authority in private as well as public life. They had the positions of power in politics, administration, and military. The men in ancient Rome were also the head of the family and had enjoyed virtually unlimited powers over their wives and children. A lot of men of ancient Rome were slaves who worked in a variety of trades and could even become artists and teachers depending on their background and abilities. Various opportunities of mingling and socialisation were available to men in ancient Rome in the form of theatres, public baths, and libraries.